It’s spring 1942, and the world is at war. Five major powers struggle for supremacy: Germany and Japan are aligned against the great alliance of the United Kingdom, the Soviet Union, and the United States. 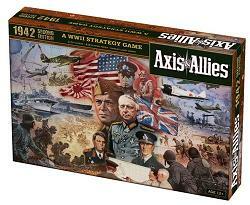 Designed for 2–5 players, the game is set in 1942 – the historical high-water mark of Axis expansion. Controlling one of the Axis or Allied powers, players will command both their country’s military forces and its war-time economy, with the chance to plan attacks, marshal forces into embattled territories, and resolve conflicts. Victory will go to the side that conquers its opponents on the field of battle and liberates or occupies the greatest cities of the world. Change the course of history in a few short hours! There are 5 new sculpts in the game including UK artillery, submarine & destroyer units; German artillery; and a Russian submarine. There’s even an all-new combat unit: the Antiaircraft Artillery!